New Delhi: Reliance Industries Ltd’s (RIL) efforts to strengthen its case against Reliance Natural Resources Ltd (RNRL) by portraying the disputed gas deal between the two as a family agreement between the former’s promoter Mukesh Ambani and RNRL’s promoter Anil Ambani that the board of RIL wasn’t aware of seems to have suffered a setback. On Friday, RIL decided to withdraw the affidavits of seven of its directors that it had submitted to the Supreme Court on 5 October and said that the board of the company had not approved and was unaware of the family agreement or the so-called memorandum of understanding (MoU) between the estranged brothers dated 18 June 2005. While RNRL has sought the apex court’s intervention in a special leave petition for the immediate supply of 28 million standard cu. m a day (mscmd) of gas from KG D6 at $2.34 (Rs108.8) per million British thermal unit (mmBtu) for a period of 17 years, RIL, in its affidavit, has opposed this, saying the price is 44% lower than that mandated by the government and it cannot supply gas at a price not approved by the government and to a user not listed in the country’s gas utilization policy. The MoU signed on 18 June 2005 between the brothers had set the rules for division of the Reliance group’s assets between them and is the basis for RNRL’s claims to the gas. On Thursday, RNRL counsel Ram Jethmalani had argued that if these affidavits were part of new evidence on behalf of RIL, then the directors would have to be present in the court for cross-examination. In Friday’s hearing before the apex court, RNRL again objected to the affidavits of the directors. RIL’s counsel Harish Salve replied that these affidavits had been filed in response to paragraph “J" in RNRL’s original petition to the court that says that “existence of the MoU was recorded, accepted and approved by the RIL board of directors". 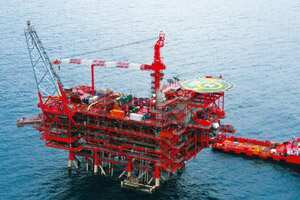 Deciding claim: A file photo of RIL’s rig in KG basin. The MoU inked on 18 June 2005 between the Ambani brothers had set the rules for division of the Reliance group’s assets and is the basis for RNRL’s gas claims. Jethmalani said that his client would stand by every single submission made before the court. Salve agreed to drop the affidavits and go by his previous submissions in the court. Jethmalani claimed victory and said: “History is repeating itself, when the government filed the affidavit in the Bombay high court and we sought to cross-examine them, they withdrew the affidavits. Similarly RIL has today developed cold feet." His reference was to a government petition in the Bombay high court when it was hearing the RIL-RNRL case. 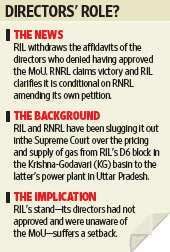 The petition effectively strengthened RIL’s case. Salve, however, downplayed the withdrawal of affidavits. And after court proceedings, he clarified to reporters that the withdrawal of the affidavits of the directors was indeed conditional to RNRL amending its petition to leave out paragraph “J". Later, another lawyer for RNRL Mukul Rohtagi confirmed that there would not be any changes in the petition. Spokespersons of both RIL and RNRL said they had nothing further to add.